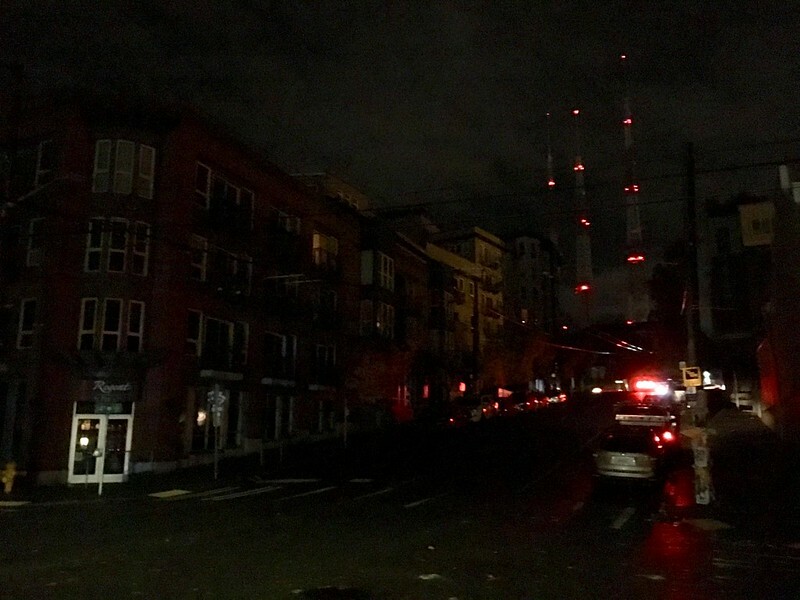 I have long bragged about how living downtown, or within three miles of downtown, has always meant no sustained power outages at my home, even when there were massive weather events that left area residents without power for days. Six years in Belltown between 1998 and 2004: not one power outage. Two and a half years on First Hill, 2004-2006: nothing; two and a half years in Fremont, 2006-2007: at worst a brief flickering of the lights, during a storm that left 700,000 without power -- including four of our PCC stores, one of them (Seward Park) in Seattle proper. And before yesterday, the only sustained power outage I experienced was indeed at this condo I've lived in since 2007, and it wasn't even due to a weather event -- it was a mechanical failure. To be specific, "a faulty connection point on a switch that feeds the underground electrical system." It was confined to Capitol Hill, affecting about 4500 people. That was on August 22, 2011, and that was also the day I showed Anthony, my second-ever roommate in the condo, the guest room. 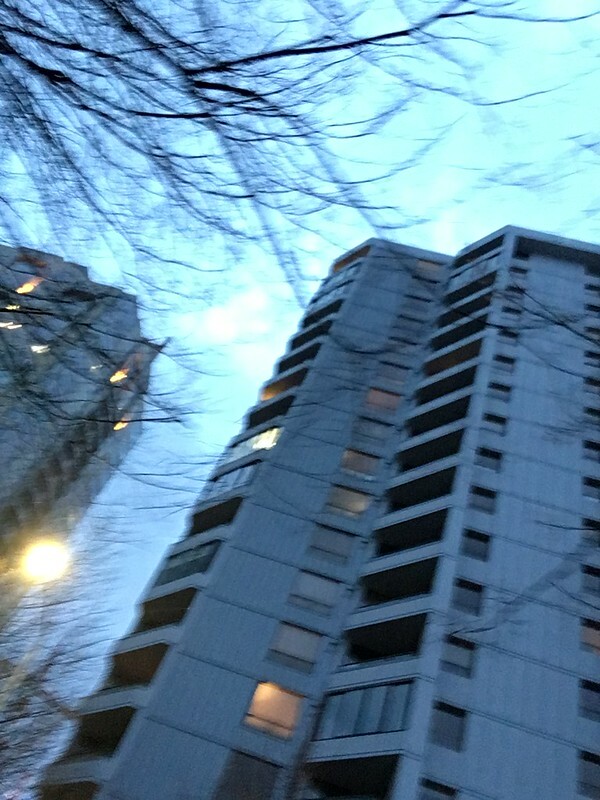 Being summer, there was enough light to show the condo itself, but we had to go up the stairwell in the dark, me leading the way, shining the light from my iphone screen right by the railing so we could both see something to grab onto. At that time my iPhone was old enough it did not yet have the flashlight app. We've had a few very brief power outages since then, but nothing like what happened yesterday. This one apparently left 150,000 without power in the Puget Sound area. Seattle City Light's website showed a map with outage areas, updated throughout the evening, and it was very blotchy. I have no idea how their grid system works. I mean, to be fair, I barely know how electricity works, so whatever. I do like this, though: thanks to both my Nest Cam (or as I call it, "Kitty Kam") and time stamps on Facebook Messenger, I can tell you exactly how long the power was out in my condo last night: five hours and 24 minutes. I always get an email from Nest camera is offline, and that came at 4:56 p.m. And I messaged Ivan that the power had come back on at 10:22; it would have actually occurred a couple of minutes, at least, before that. In any case, let's just say five and a half hours. I had heard things in passing about a coming storm but hadn't really paid as close attention as I clearly should have. Things got pretty dark and dicey-looking out the windows at work by mid-afternoon. When I got up to leave, Scott said, "Stay safe out there, Matthew." I was like, yeah, okay. I got outside and still thought I would try walking downtown where I was to meet Evan for dinner, even though it was windy. I knew it was a risk to my beloved clear umbrella with the white and purple stars on it, but it was partially busted anyway and I knew I was going to need to buy a new one soon already. What I wasn't counting on was a wind gust just as I crossed Broad Street on Elliott, right at the old Old Spaghetti Factory building, that was so hard it literally nearly knocked me over -- and in the middle of my crossing the street, it just completely collapsed my umbrella. I was pointing it against the wind, so it didn't turn the umbrella inside-out as wind often does. Instead, it just broke all the thin metal rods through the plastic in the other direction. I had to continue walking with this busted umbrella in my hand, getting soaked and beaten by wind and rain as I walked. I finally decided maybe I should give up on this walking idea and catch a bus. It was either Cedar or Vine street I turned left on to go up to Third, which meant walking four blocks uphill in that wind and rain -- a pretty long way in those conditions. I still decided I wanted to post a selfie showing what the weather had done to me, and as I pulled my phone out and opened the camera app, I guess I accidentally took the picture of the building you see at the top of this entry. I didn't even notice that on my phone until this morning. I kind of liked the picture and so I kept it. Once I reached a Rapid Ride bus stop on Third Avenue, the shelter gave me semi-protection from the rain. It also provided a surprisingly stylish backdrop and pretty great lighting for the fairly spectacular picture that resulted. It garnered such positive reaction on Facebook that it elicited more complimentary comments than actual likes, including one person going so far as to say I looked "like a movie star"! 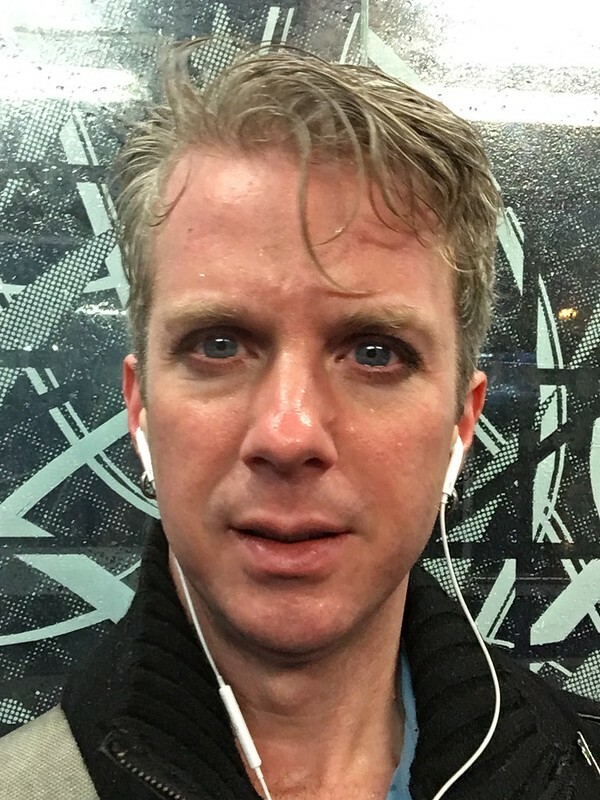 I happened to find, finally, a garbage can on the sidewalk as I headed to that stop, so I was able to throw away my busted umbrella before getting on a D bus headed south. While on the bus ride, looking out the window, I saw two different other busted umbrellas just skidding in the wind down the street. I got off at Pike Street, and first went over to Target, because I needed to get some hand soap and mouthwash. Another gust of wind nearly knocked me into a construction hole in the sidewalk, which had warning equipment around it, but I still banged my head into the thick pole standing out of the center of it. Had I not caught myself I would have tripped right in there with that wind gust. Then I walked back over to Fourth Avenue, at met with Evan for dinner at Veggie Grill. She had apparently parked at a Park & Ride on Mercer Island and taken a bus the rest of the way in from there; she texted me around 4:00 that "It's stormy!" Um, yeah. Anyway, this was the first time in ages I did something with her but without Elden, who apparently has a new work schedule keeping him working until 7:00 and not often home before 8:30. I don't mind when he comes along, though; I like him -- and a boyfriend just goes with the friend, I know how that works. They basically become a package deal, which is why there is no need for friends ever to ask if it's "okay" if their boyfriend or girlfriend or spouse join us for something. Why wouldn't it be? People should never ask for permission for that. I never do. Sure, out of politeness I might give a heads up: "Shobhit will be joining us." But I would never add, "if that's okay." Evan and I tried to remember the last time we'd eaten at Veggie Grill together. I knew it had been several months. She didn't think it had been a terribly long time. I remembered both Elden and Shobhit had been there, and we all tried their Beyond Burger for the first time. Shobhit and I both found it actually too realistic, too much like a red, cooked-rare burger patty. Evan liked it a lot. Anyway, I figured out this morning that had been on February 20. Nine months ago. Evan could have had a baby! I decided then that one day I would give the Beyond Burger just one more chance, and next time simply ask them to cook it well done. They did cook it better this time, and it definitely made for a better burger -- but it still comes nowhere close to the spectacular flavor and perfect consistency of a Field Roast burger patty. Although I ultimately found the burger last night satisfying, I think I'm done with it. So many of their other dishes are so much better, particularly the pesto veggie chicken sandwich I love so much. So next time at Veggie Grill, it won't be another burger. It's too expensive anyway -- with tax and tip it came to over $16, which is stupid. I didn't even have a drink or an added side. Evan and I had lots of lively conversation, which occasionally made me think of Ivan and how often we go out to eat and sit largely in silence. To be fair, I don't live with Evan, and if I did, perhaps we would run out of things to talk about more quickly as well. Ivan's just not always the most talkative person anyway. In my ever-increasing distancing from my own history as a persistently quiet person, even at the Neko cat café on Sunday I was the only one full of questions for the employee in the cat room -- not just more than Ivan, but more than the other eight paying customers in the room. Also I just realized recently that I have a friend named Ivan and a friend named Evan, both of whom I talk about frequently, and when speaking it's very easy to hear one name when it was actually the other one being said. Their names have a difference of only one letter, and the differing letter is itself a vowel. The distinction was much easier when Evan was still allowing me to call her Ev. And then she has to go and start dating a guy named Elden! That's not massively different from "Evan" either. They sound like siblings, actually: Evan and Elden. A nice name for twins, I would think. We talked a lot about movies, as Evan and I are wont to do. By the time we were done and headed out again, the rain had largely let up, mercifully -- it was only a few blocks to the Meridian, but that's plenty to get soaked in when there's a wind storm. We then went to see My Friend Dahmer, which we arrived at about half an hour early. It had clearly been a long time since Evan had been there: countless things were different to her -- the single manned ticket counter flanked on one side by a longer bank of self-serve kiosks (automation is coming for all of us! -- and that's not even really a joke); the stripped walls in the stairwell to the bathroom; the paper theatre numbers because the digital readouts are currently inoperable (still a lot of slow-going renovations going on); the reserved seating for reclining plush chairs they now have in all screening rooms. I'm beginning to wonder when Pacific Place's AMC theatre will catch up to that setup, but it's nice not to have to pay the $1.58 "premium seating" extra markup there. After a seemingly endless parade of trailers, the movie finally started, and I ultimately gave it a B+, although calling it a "good" experience is almost problematic. This is about Jeffery Dahmer as a high school teenager, and the very beginnings of how fucked up he was. It's compelling at first, and then increasingly unsettling as it goes on. The review I wrote is probably fine -- as they always are no matter how I feel about it while writing them -- but felt kind of stilted and unusually truncated as I wrote it. Because I had to write it at Cupcake Royale, the only place near home that had power even after the movie was over. Evan and I parted ways on Pine Street, as she went to the Metro Tunnel and I caught an eastbound #49 to Broadway. About halfway up the hill, I looked out the window and found the complete blackness a little jarring -- I had forgotten how much of the city still had no power. (Downtown, as always, was totally fine.) But deeper into Capitol Hill, there were odd pockets of still-working power, particularly on Broadway itself. I walked a block over to Bartell Drugs, and had power and street lights the whole way, but could still see apartment buildings even half a block away without power. I bought a new umbrella. They had more of the very same one! I was very excited. It's like the one I had before was never even busted. Although I immediately busted even the second one, right there at the register, when I tried to break the tag off, and instead of snapping the plastic ring connecting the tag, it snapped the plastic umbrella clasp in two. The cashier was very kind though and let me just go exchange it for another one -- thankfully they had several. "I'll just say this was already broken," she said. Thank you, cashier lady! I also bought a Reese's peanut butter cups "stuffed with crunchy cookie." Don't tell anyone. I walked most of the rest of the way home from Bartell Drugs eastward on Pike, and on that street all the power was on, on both sides of the street. Haflway across the block to the north toward Pine, though, power was off again, and most of Pine had no power on either side -- except for about two blocks both west and east of Broadway, which did have power. As I said, very odd and inconsistent grid functions. My building was still totally dark, as seen in the photo at the bottom of this entry. The electric fob readers were still running on reserve power -- or at least the one at the east building was. A lady opened the door for me before I could even try scanning, telling me the reader at Braeburn West was not working, and asking how to get to the garage so she could get across. The garage layout to our two-building complex is odd: the east building has one garage level, beneath the east building only, with 15th Avenue access with maybe 24 spaces. The garage access from 14th Avenue has two levels and actually goes beneath both the west building and part of the east building. So, as I directed this lady, you can go down the stairwell (dark, at this time) two levels and open the door and you're in the west building parking garage. You can then walk across and go back up and into the main part of the west building -- a convoluted way, but one way to go between the two buildings without ever going outside. I walked up to the fourth floor via the stairwell, but at least I had my flashlight app this time. Shobhit had lit a bunch of candles in the kitchen and living room, and was sleeping on the couch -- snoring as always. He keeps falling asleep nearly every early evening, presumably due to residual effects of jet lag. I don't imagine that'll happen much longer. He also keeps waking up super early. He was in the middle of making the pasta he had intended to make last night before the power went out, when I woke up at 5:25 this morning. I just had some of it for lunch. But last night, there was no cooking to be done. I was careful not even to open the refrigerator or the freezer doors, for fear of making perishables go bad faster. I think most, if not everything, pretty much survived okay. Shobhit woke up briefly and asked why I was wasting my phone battery on the light. Well, I still need to be able to see to put my coat away. But, he also had a point. I messaged Ivan that the power was out -- he was at work -- and set the phone in the bedroom. Then I went out to the living room with my iPad. Then I remembered the wifi wasn't working. Duh. I literally had nothing to do. I couldn't write my movie review on the computer. Hell, I couldn't even read a book -- there was not nearly enough light, even from the candles. I suppose if I had really wanted to I could have gathered several candles together to read by the light of at the table. Note to self for next time! But, I still didn't want to have to wait until this morning to write the review, and I knew there was power on Pike Street. So, I woke Shobhit up again and told him I was going to a coffee shop, both so I could charge my phone for a bit and so I could write my review. I brought my phone (as always) as well as my iPad. I walked into Cupcake Royale first because it was the first place that could offer what I needed that I walked to. They had a small table with an available outlet, so I ordered a chai and sat. I also bashed my head on a chair when I leaned down to plug my phone in. That was fun. I was able to connect both the phone and the iPad to their wifi. I didn't realize they closed at 10:00. Maybe I should have gone straight to Café Vita as originally intended. I wasn't quite done with writing my review, and had only gotten it to about 400 words, when they closed. I walked down to Café Vita, which was predictably super packed. They had little metal tables outside too, though, so I sat at one of those and was still able to connect to their wifi. I added a few more lines to the review. But, I couldn't figure out how to add the photo to the post when using Safari on a mobile device, which was very annoying. The button just wouldn't work. But, oh well. I could still save the draft, and I was therefore productive for a bit less than an hour. I walked back to the Braeburn, and encountered a new problem. The fob reader on the east building was now not working. Some time ago, for security reasons, all the key locks accessible from outside the building were protected from any use, in favor of the fobs. This way people could not duplicate keys and let in a bunch of unauthorized people. The problem, of course, is when the power goes out. I knew this had come up as a concern on the bulletin board a long time ago, but could not recall a solution. I went from door, to door, to door, around both buildings, and could not get in. At least two other people were trying to get in too. I was nearly to the point of finally trying to call Shobhit, who wasn't even guaranteed to wake up to answer, when, at about 10:20, the lights on the whole block suddenly came back on! What magical timing! So, it took me until a bit later than usual before I was in bed last night. I even saw Ivan briefly, even though he came home one bus later than usual and came in the door around 11:10. When I messaged him later about feeling like an idiot for not checking the garage doors, he just responded, "Well you should also feel like an idiot for going to watch My Friend Dahmer without me!!" I was sort of weirdly touched by that, actually. I had even thought of him while watching the movie -- realizing then that he'd probably have been interested in it. I was finally asleep at about 11:30. I got only nearly six hours of sleep, but I seem to be coping fine.